Event marketing focuses on face-to-face interaction with clients via trade shows, live events, corporate meetings and more. In the 2018 Benchmarks, Budgets, and Trends report of The Content Marketing Institute, 75% of marketers list “live events” as a top marketing tactic. Event marketing allows you to build brand awareness firsthand. With events, you can interact with your customers in real-time. The advantage to that is that you can answer their questions and clear their doubts promptly. If you have an event manager, you can decide together whether getting media attention is one of your goals. If the media covers your event it’s a great opportunity to gain additional exposure for your brand and company. Consider also reaching out to influencers in your niche – schedule a meeting and give them an invitation to experience and possibly promote your event. With a live event, not only will you be able to promote your brand, but you can actually generate leads. Being strategic with your targeted audience gives you access to your target demographic so you can actively engage with strong prospects. When you announce or send specific invitations out for your event, the people who attend are those who have an interest in what can help them – your business. These prospects are more likely to be open-minded and ready to learn more about what you can offer. A product launch event is necessary, especially if you are a startup. It is designed to create awareness and build publicity for your products that are soon to be released into the market. It can generate a great buzz if done the right way. The success of the event can determine the success of the product during the launch phase. The ultimate goal of this type of event is to gain exposure. So how do you organize this event? To start you’ll need to set a budget. Next, make a list of potential guests. You’ll also need to choose a theme, find a venue and set the date. And most importantly, you’ll need to get the word out. Reach out to your target audience – your ideal customer. Remember that your event manager can help you with all of this. If you want your brand to be big, you not only have to impress your customers, but you also have to leave a lasting impression on influencers. Invite people who have an extensive following in the industry or niche of your ideal customer and encourage them to share their experience to their social media networks. This way you’ll be able to spread awareness of your brand to an audience outside of your immediate circle. During your event, you may also find business partners or a new source of potential leads. In the business world, the larger your network is, the better. People always love brands that help the community and spread positive messages. If you want your company to gain some media attention and support, you can link your brand to a worthy cause. Find out what matters to you and your target audience, then organize a community event that’s in-line with your values. This can boost customer loyalty amongst those that believe in your mission. There are many reasons to use event marketing to promote your business. However, are there instances when you should not utilize it? There is only one valid reason why you should not host your own company event—when you do not have a clear objective for the event. Hosting a poorly organized event with no objective is worse than not hosting an event at all. Your event manager can help you work out any issues in order to ensure your event successfully promotes your business to your ideal client. 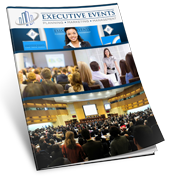 The team at Executive Events is ready to assist in planning your next objective-focused event. Contact us today at Info@AssistMyEvent.com or 757-785-5081.